Who says that you can’t play with your food before eating it? 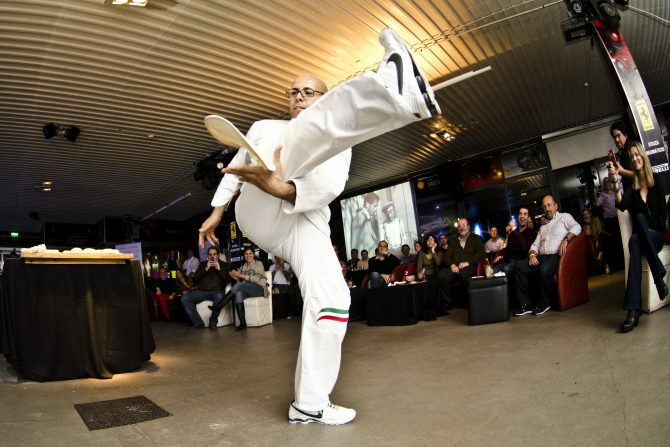 Chef Pasqualino Barbasso, two-time Pizza Acrobatics World Champion is here to prove that notion wrong! Pizza, and acrobatics? At first glance, the thought of there being such thing as Pizza Acrobatics seems pretty unbelievable. Is it just a gimmick? Would the pizza even taste good? Well, we headed down to Fratelli Pizzeria at Resorts World Sentosa to catch Chef Pasqualino in action, and see if he would quell our doubts! Hailing from Sicily, Chef Pasqualino learned the secret to making exceptional pizzas in his family restaurant, Falco Azzurro, in the Sicilian province of Agrigento. He first won the Sicily’s Acrobatic Pizza Championship in 1998 and has spent the last decade traveling the world; performing his craft and promoting Italian food culture. 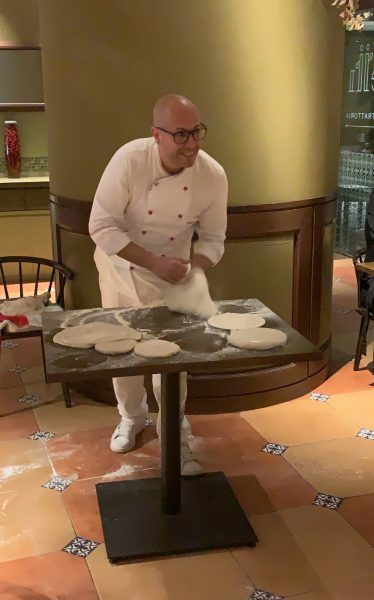 It was indeed amazing, being able to watch Chef Pasqualino toss and flip the pizza dough to the funky upbeat music before our very eyes, at one point even “juggling” three discs of dough! And all with an affable grin on his face. Of course, we were curious as to how Chef Pasqualino’s pizzas would taste, too. And we’re here to tell you that they are – chef’s kiss – amazing! We tried two of the pizzas on Chef Pasqualino’s exclusively crafted Gourmet Pizza Menu: the Romana (S$36) – roasted pork “Porchetta”, marinated vine cherry tomatoes, smoked scamorza cheese, roasted potatoes, and Mozzarella – as well as the Mediterranea (S$34) – a tomato-based pizza with mozzarella, fried eggplants, Taggiasche olives, sun dried tomatoes and basil powder. The Romana pizza was hearty and savoury with the porchetta and potatoes, with the cherry tomatoes bringing a burst of fresh tangy sweetness. Meanwhile, the Mediterranea was wonderfully aromatic with its use of basil and sun-dried tomatoes, and we surprisingly liked the eggplant slices, which were tender and flavourful. For bread-lovers: the crust was definitely the highlight of both pizzas! Crisp, yet not too thin, with a good crunch at the edges; we were tempted to have yet another slice just for the wonderful crust. Looks like stretching out the pizza dough with acrobatics does pay off! Some other pizzas offered on the menu include Sirenetta: Puglia Burrata Cheese, Mazara Red Prawn Tartare, with Rucola Salad and Lemon Zest; Arrotolata: Asparagus Cream-based topped with Mozzarella, Buffalo Ricotta Cheese, Loch Fyne Smoked Salmon and Mesclun Salad; and Tonnata – Mozzarella with Roasted Dutch Veal, Tuna Sauce, Caper Berries and Spanish Anchovies. Chef Pasqualino’s Gourmet Pizza Menu is only available until 9 March, so if you would like to try gourmet pizza that has gone through some serious gymnastics, don’t hesitate! 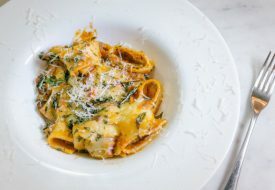 Another stand-out dish we enjoyed at Fratelli Pizzeria was the Pici del Buttero (S$34): Homemade Tuscan Egg-less Pasta ‘Pici’ with 12-hour Red Wine Braised Beef and Porcini Mushroom Ragout. 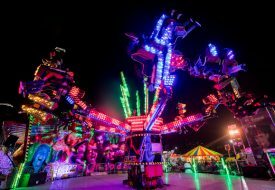 While it may not look very photogenic or appetising, or like a mere bowl of mushrooms (as was our first thought) – looks, they say, can be deceiving! The pici was al dente and made for a great vehicle for the ragout, which we wished there was more of! 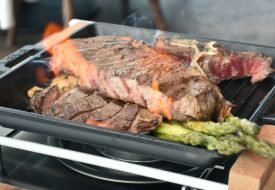 The braised beef was tender and rich, and we liked how the taste of the mushrooms, while unmistakable, was not overpowering. 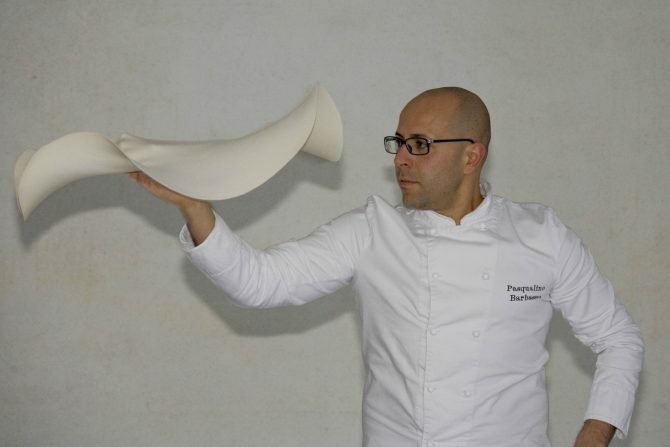 Chef Pasqualino will be conducting his Pizza Acrobatics Demonstrations during lunch (1:15pm) and dinner (7:45pm) daily until 9 March 2019, with the exception of March 5, so if you want to catch him in action with his gravity-defying pizza stunts, do hurry! In addition, if you would like some hands-on action, you can also sign up to learn how to make authentic artisanal pizzas at the Pizza-Making Classes personally conducted by Chef Pasqualino. For reservations, email: dining@rwsentosa.com or call +65 6577 6688.